FEEL CALM INSTEAD OF ANXIOUS AND STRESSED: Do you often feel overwhelmed with worry or racing thoughts? Our natural stress supplement can help relieve your daily stressors, calm your mind, and help you take on the day feeling more positive. Mingle more confidently in social settings, bring focus to that work presentation, be a better version of you. Try Pure Serenity today and experience it for yourself. 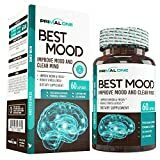 ANXIETY RELIEF WITH THE POWER OF A STACK: Why settle for a single ingredient solution when you can get the power of multiple ingredients working together? Combining 5-htp, GABA, Ashwagandha, Rhodiola Rosea, Bacopa Monnieri, Chamomile, & Magnesium is like trading in a two-wheel bike for the power of a turbocharged engine. 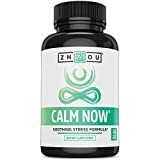 Our calming ingredient combination works together to naturally reduce cortisol (the body’s stress hormone) and support healthy serotonin levels for an effective mood boost. THE PACPURE DIFFERENCE: We are dedicated to bringing you the smartest and most effective supplement formulas available. At PacPure we team up with our lab to focus on the leading supplement research and create the very best formulas for helping you reach your health goals. We will always bring you the best that nature has to offer. A NATURAL SOLUTION WITHOUT HARMFUL SIDE EFFECTS: With so many synthetic ingredients on the market that can produce harsh side effects, our natural stress supplement offers an alternative that uses proven ingredients your body will recognize and be able to use. Straight from nature to your health. OUR COMMITTMENT TO YOU: We are dedicated to bringing you the best supplements available. Pure Serenity anti-anxiety relief supplement is carefully formulated right here in the U.S. where it is rigorously tested for quality. You can always purchase with confidence knowing you are backed by our 60-day, 100% money-back guarantee, so give Pure Serenity a try today. WHY ADD PURE SERENITY TO YOUR DAILY ROUTINE? Would you like to be your best self? Our vital formula lets you harness the power of nature with ingredients that can naturally help elevate your mood and boost a feeling of calm, relaxation, and well-being. WHAT IS IN OUR PREMIUM BLEND? Our ingredients: Thiamin, Vitamin B12, Magnesium, Bacopa Monnieri, GABA, Ashwagandha, L-Theanine, Rhodiola Rosea, Chamomile, 5-HTP, Inositol, Bioperine.